Beginning June 1, 2016, according to the Financial Services Commission of Ontario, in order to make insurance premiums more affordable, the benefits and coverage regarding medical, rehabilitation and attendant care are being slashed. For most injuries, the combined limit of $86,000.00 for the aforementioned coverage is dropping to $65,000.00. For “catastrophic” injuries, there is a drop from $2,000,000.00 to $1,000,000.00. 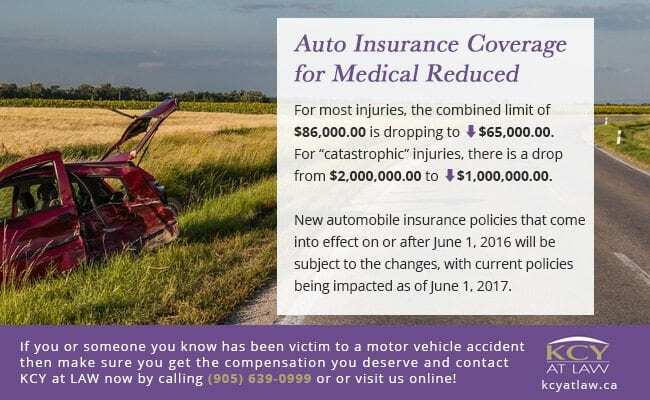 New automobile insurance policies that come into effect on or after June 1, 2016 will be subject to the changes, with current policies being impacted as of June 1, 2017. While $1,000,000.00 or even $65,000.00 may initially sound like a lot of money, depending on whether there is a viable lawsuit against one or more individuals who may be at fault for a motor vehicle accident, it may be all you have access to for the remainder of your life. That means that careful consideration will have to go into whether or not you accept or reject certain forms of treatment in favour of other forms of treatment or assistive devices. Once the money is gone it is gone and the money can be spent a lot quicker than you might think. 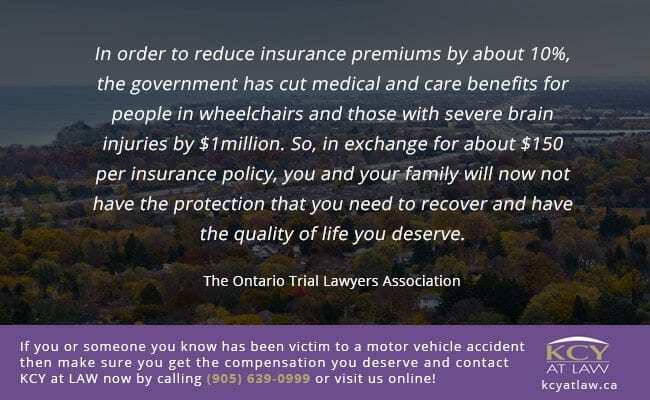 According to the Ontario Trial Lawyers Association “In order to reduce insurance premiums by about 10%, the government has cut medical and care benefits for people in wheelchairs and those with severe brain injuries by $1million. So, in exchange for about $150 per insurance policy, you and your family will now not have the protection that you need to recover and have the quality of life you deserve”. 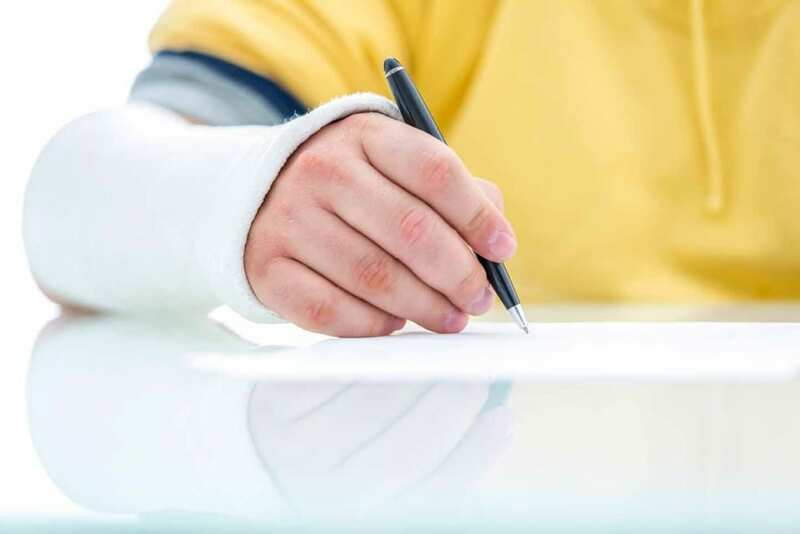 In light of these changes, OTLA suggests that individuals use the money they save vis-à-vis lower insurance premiums to buy optional catastrophic injury coverage totaling $2,000,000.00. These significant changes in automobile insurance coverage could easily be the decisive aspect as to whether someone is able to achieve a full recovery and put individuals and families alike at an increased risk of having to pay out of their own pocket(s) should they require any further treatment or aid beyond the insurance limits. Individuals need to appreciate the impact that these changes have and why it is so vital that optional forms of additional coverage are obtained. Otherwise they risk being put in a much more precarious situation, left without any recourse. 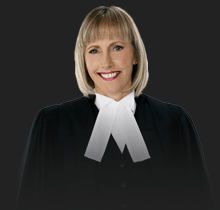 If you or someone you know has been victim to a motor vehicle accident and has been suffering from serious and permanent injuries as a result, we at KCY at LAW have the expertise and experience to ensure you are armed with the knowledge you need and that you get the compensation you deserve. Call us now at (905) 639-0999 or contact us online to book your FREE consultation! “Textalyser” Device To Combat Distracted Driving Related Accidents Injured In An Accident But Back To Work?